A Short Ride to a Historic Hidden Gem in the County. 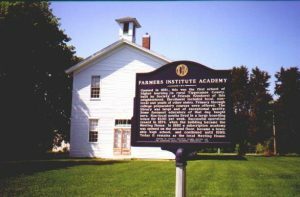 Farmer Institute Academy on 660 South is an historical and architectural gem on one of the prettiest roads in the county. Farmers Institute, built in 1851, is a gable-fronted, Greek revival-style, two-story building. It was the first school of higher learning in the county (18 years before Purdue). It was built by the local Quaker community and included a dormitory building for the students. It is like a bit of New England dropped into Tippecanoe County. Directions: This is a 13 mile loop on paved roads from Mayflower Mill School (if you want to ride from downtown go south on 9th Street to 500 S and turn right to get to the school, this will add 12 miles to the route). Turn right (west) on 500S cross 231 and stay on this road which will turn at Hickory Grove Cemetery and become 550 S. At the railroad crossing notice the old Taylor Station. At the crest of the rise you will pass the Robert Dearborn House (c.1874 Italianate). Continue on 550 S until it dead ends at Sleeper Road. Turn left (south) on Sleeper Road and go to the first road on the left 660 S. Turn left on 660 S and shortly after you pass 475 W Farmers Institute is on your left. Stop and read the sign and look in the windows. The building is still an active Quaker Meeting house. After enjoying Farmers Institute continue east on 660 S. Shortly, there will be the Hollingsworth Farm on the left (c.1870 Italianate remodeled in 1920). Subsequently, you will come to the historic Farmer’s Institute Cemetery on your left at 375W. Make a left (north) on to 375W and return to 550S. Turn right (east) on 550S. After crossing the railroad tracks stop and admire the Taylor Farm house (1863 brick Italianate) before returning to the Mayflower Mill. Have a great ride. A 2+ Mile Route past some of Lafayette’s Oldest Homes and Hidden Gems. No matter where you ride in downtown or the near downtown neighborhoods you are continually passing historic properties. Here’s a short route that highlights some of the oldest structures and a few hidden gems. The ride starts at the Downtown Library parking lot. Head east out of the library parking lot to 7th Street. Ahead of you is the oldest Jewish Temple building in Indiana. Temple Israel was built in the Italianate style in 1866-1867. Note the Star of David in the circle above the center window. Turn right (south) on 7th street and go two blocks to New York Street and turn right (west). Midway in the block notice 617 which is a lovely Queen Ann Cottage (1890) which has just had a two year restoration. Continue to 6th street and notice the James B. Falley Italian Villa House on the corner (1862-1864) that presently houses the Sousa Foundation. Turn left (south) on 6th street and proceed to 420 Romig, the James Alexander House, an 1880 Queen Ann mansion. The current owner is an avid gardener and has one of the best gardens in the city. Turn around and go back to Romig Street and turn left (west). Go to 3rdstreet and turn right (north) go to 110 S. 3rd. This is the Sample house, a Gable-front/ Greek Revival house c.1855. This house use to sit 87 feet closer to Alabama street but was moved to make way for the new development on the corner. Turn right (east) on Alabama street and go to 5th St. Turn left on 5th street. 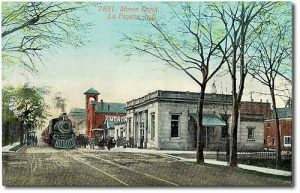 At North Street note the Monon Depot (Civic Theater) a 1901 neoclassical structure and the set of rails in the street. The rails commemorate the first railroad in Lafayette that ran down the middle of 5th street. Continue north on 5th Street to Cincinnati Street. On the northwest corner you will find 602 N. 5th . This is the charming General Richard DeHart House, a Central-passage/Greek Revival 1845 house. Turn right (east) on Cincinnati and go to 7th street. 708 Cincinnati is the Knight-Loeb House, a grand 1995 Italianate home. Turning right on 7th street, go to North Street. Turn left (east) on North and ride one block to 8th Street. Head right (south) on 8th street to Ferry Street. Turn right (west) on Ferry street you will find 608 Ferry St. This is the Reverend Samuel Johnson House, a classical 1844 Greek Revival. Turn left on 6th Street and note the Painters and Decorators Building (217 N. 6h. ), a 1923 Renaissance Revival building which is currently under restoration/renovation. Proceed south on 6thStreet to Alabama Street, turn left (east) and return to the Library parking lot. As you have probably noticed on your ride, the downtown area is loaded with many beautiful interesting historic structures. You can find out more about those noted here as well as the many not mentioned from materials in the Tippecanoe County Library, where you began and ended your ride.